Glimpsed through the windshield of Kyle Newmiller’s pickup, the peaks of the Crazy Mountains razor through the parting clouds. We’re bumping along a dirt road in southwest Montana, cruising through miles of tan foothills, occasionally dropping down along Sweet Grass Creek amid stands of blazing yellow cottonwoods. Earlier today, it was raining, but now the clearing sky reveals a crisp snow line at 7,000 feet. “Isn’t that beautiful,” says Newmiller, grinning. A construction contractor and avid hunter, he’s driven an hour and a half from Billings, Montana, along with his 7-year-old daughter, Jordan, and his dad, Doug, a 40-year veteran at the local coal-fired power plant. In the coming weeks, they’re hoping to pack some horses into these mountains, maybe bag an elk. If, that is, they can get access. Newmiller is edgy, thinking about last summer, when he came out to talk to ranch owner Tony Carroccia. He says Carroccia told him that he’d need written permission from the three other landowners along the road to get access during hunting season. Newmiller countered that he didn’t need their permission because this road is a public access — a claim he backs up with old Forest Service maps showing a public trailhead here, as well as evidence that the road once served a school. That’s when Carroccia “told me to get off his property,” Newmiller recalls. Carroccia denies that the incident took place. The scuffle over Sweet Grass Creek is part of a much larger struggle in the West. In Montana alone, more than a dozen access conflicts have flared up in recent years, as landowners gate off traditional access routes and effectively put hundreds of square miles of public land out of reach for people like Newmiller. Some conflicts, including the one here at Sweet Grass Creek, have smoldered for years or even decades. In many cases, landowners profit in various ways from the exclusive access to adjacent public land. In an ideal world, anyone would be able to easily access the half-billion acres managed by the Forest Service, the Bureau of Land Management and other federal agencies in the West. But I’m struck by how tenuous, even fragile, our connection to that land is — including the land in this particular corner of Montana, near my home in Bozeman: just thin threads of roads, where access often hangs more on the will of a landowner than on whether a road is truly public or private. Who gets to enjoy the benefits of public land, and at what cost, is more complicated than the crisply mapped property lines. And opening public access is always more difficult than closing it off. Kyle Newmiller at home near Billings, Montana. He has been locked out of some of his favorite hunting spots by landowners who have blocked access to public land beyond their property. The roots of the problem reach back to the 1800s and early 1900s, when homesteaders carved out millions of acres from federal holdings in the West, forming rings of private land around islands of public land. And in what was probably the biggest giveaway of public resources in history, the federal government spurred westward settlement — and set the stage for innumerable future disputes — by dispensing sections (640-acre squares) to railroad companies, creating checkerboards of private land within those public-land islands. For decades afterward, the public generally accessed public land on roads scraped in to serve homesteaders, miners and loggers. In those less-populous times, landowners were more tolerant of people crossing their property under informal, usually undocumented, arrangements. Today’s camo-garbed hunters and pole-toting hikers still rely to a surprising extent on those roads. And the need for more legally binding rights to use them has grown, as a rising tide of public-land users collides with a new generation of landowners. Nationwide, it’s hard to calculate how much progress has been made since 1992, because the agencies don’t track the amount of land that is not adequately accessible. One Forest Service official in Washington, D.C., estimates that as much as 20 million acres of the agency’s land still lack adequate access today. A 2013 report by the Center for Western Priorities, a Denver-based think tank, identified 4 million acres of Forest Service, BLM, state and other public lands, in six Western states, that were completely inaccessible. Montana had the largest share — nearly 2 million acres — of this “landlocked” public domain. In Bozeman, Dennee spread a map across the table and described his biggest success — a massive land swap in the 1990s, when a cooperative Congress passed a bill consolidating tens of thousands of acres of old railroad checkerboard strewn across several mountain ranges in the Gallatin National Forest. “That resolved access across more than 150 miles of trail,” he said. A similar land deal in the ’90s, in which Dennee also played a major role, brought 39,000 acres of private checkerboard land in the northern Crazies under Forest Service ownership. He mentioned more success stories, including some that relied on productive partnerships with Montana Fish, Wildlife and Parks, the state’s wildlife management agency, as well as with national nonprofits, including the Rocky Mountain Elk Foundation and The Trust for Public Land, and local access advocacy groups. “People do rally around access issues, and set aside their differences,” Dennee observed. But the bad news is that partnerships are becoming more necessary as the Forest Service is hit with tighter budgets and staff reductions. Dennee can remember a time, as recently as a decade ago, when each of Montana’s eight national forests had a lands specialist dedicated to improving and safeguarding public access. Now only three staffers oversee access issues for the national forests and grasslands extending over the greater part of Montana and into North and South Dakota. Meanwhile, younger staffers coming up through the ranks lack the necessary expertise, he says. Bob Dennee negotiated many access deals during his 39 years with the U.S. Forest Service. In Montana, the agencies have a tenacious ally that other Western states lack: the Public Land/Water Access Association (PLWA). Founded in 1986 by a retired Forest Service staffer, the all-volunteer group has a website that boasts of its “pit bull mentality” and lists dozens of battles it has waged against uncooperative landowners. “The guys shutting off access to the public lands — it just didn’t sit good with me,” says Bernard Lea, who joined PLWA in the 1980s, while he was working as a Forest Service lands specialist. His home is surrounded by big cottonwoods, just off a commercial strip in Billings, and he jokes that his open-heart surgery the week before has “kind of backed up” a couple of access cases. He hands me a binder full of survey records, handwritten letters exchanged by ranchers and county clerks, homestead patents and other obscure legal documents — all evidence he gathered for the first access case he pursued for the Forest Service. It proved that a road — which had long given the public national forest access — had originally been approved and paid for by a local county government at the request of homesteaders in 1910. Therefore, a landowner’s attempt to close it was illegal. Now, Lea trains other PLWA volunteers to do this work. In courthouse basements, they dust off thick tomes and read thousands of pages of county records, often having to decipher inscrutable cursive script. “You just about have to read it word for word,” Lea says, because the key details that could decide a case “come out of the blue.” Sometimes, the volunteers searching old archives come up empty-handed and resort to other tactics, merely documenting that the public has previously used now-contested routes, a basis for securing “prescriptive” access rights under Montana law. Click on chart to view larger. The work is tedious and sometimes takes decades to pay off, as it did in a struggle that began in 1997, when new landowners gated a road that historically provided public access to more than 25 square miles of national forest in the Absaroka Mountains, southeast of the Crazies. Backed by locals, PLWA and the Forest Service negotiated temporary easements that reopened the road until 2009, a period during which they hoped to secure permanent access. But their efforts failed, and in 2009, Dennee and other Forest Service officials initiated the process of seizing ownership of the road’s right-of-way under federal eminent domain laws — a long and costly procedure that must climb through every level of the agency to Washington, D.C., and then be approved by the secretary of Agriculture as well as by both houses of Congress. At the urging of Montana’s Sen. Jon Tester, D, and agency higher-ups, the landowners and the Forest Service agreed to construct a new road through both public and private land — another lengthy process, requiring environmental review. Now, more than 17 years after the original road was closed, the new one is nearly ready. The landowners, who paid for the portion of it across their property, “should be commended for working with us,” says Dennee. Paul Hansen allowed access to public lands through his Montana ranch until the costs became too high; he eventually sold public easements to his ranch roads to Montana Fish, Wildlife and Parks. 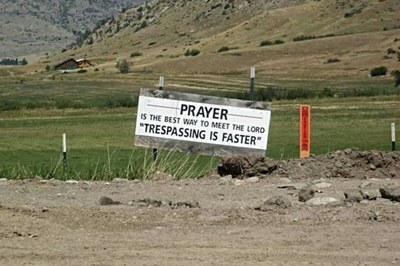 On the other side, private landowners often have good intentions, too. Until 2012, for instance, Paul Hansen allowed access through his Montana ranch to federal lands roughly 140 miles southwest of the Crazies. The ranch, which has been in his family for four generations, stretches 25 miles along a county road in a narrow valley bracketed by sagebrush foothills and timbered mountains. Several of its roads branch from the county road and climb into BLM land, with Forest Service land not far above. It’s prime elk-hunting territory, and during hunting season, Hansen allowed people to use his roads, which were never gated, and even hunt portions of his land; the rest of the year, he paid little attention to the issue. But the number of hunters grew each year until they became a problem. So, in 2012, the Hansens dropped out of the state’s block management program and closed their private roads, cutting off access to the adjacent public land. Angry hunters complained to the BLM and the Montana Fish, Wildlife and Parks agency. Some were especially riled to learn that Hansen had leased exclusive hunting rights on his land to a neighbor, James Lincoln, a wealthy newcomer who owns a network of nursing homes in Missouri. The BLM asked Hansen to reopen his roads, but he refused, so the agency moved ahead with a plan to open public access by re-routing sections of the county road through BLM land. Hansen realized that the access route would be restored, even if it cost the agencies, so he agreed to sell public easements on his roads. Fish, Wildlife and Parks paid Hansen $33,000 for the easements, securing much of the funding from the Rocky Mountain Elk Foundation and local sportsmen’s groups. The BLM opened the new, year-round access in time for the 2014 hunting season. But like many landowners controlling public access, Carroccia also has a financial interest: He runs a guest ranch in addition to his family’s cattle business. The Sweet Grass Ranch website advertises several guest cabins and rooms, available for upwards of $1,750 per person per week, offering opportunities for horseback riding, hiking and fishing — flashing the scenic beauty of the Crazy Mountains and inviting guests to “trek into our backcountry to enjoy unspoiled high alpine lakes and jagged peaks,” some of which lie on his land, and some of which are in the national forest. Although Carroccia says he allows access during hunting season if hunters have permission from the other landowners along the road, it’s not easy to get that permission. One of the landowners, Chuck Rein, who boasts about his ranch’s fourth-generation roots on his outfitting business website, charges up to $6,000 for multi-day hunts pursuing elk, deer and mountain goats, mostly on his land but also on the national forest, including up Sweet Grass Creek. When I phone Rein in August, he complains about being inundated with calls from hunters; over lunchtime, he’d already turned down three requests. He grants access to some hunters during the final days of the big-game hunting season, to hunt cow elk, and even sometimes hauls out their kills for them, he says. But Kyle Newmiller says Rein never returned his calls, and the locked gate we hit in October is on Rein’s land. Tony Carroccia says, “We’re working hard to allow access, but keep a little bit of control.” The Forest Service maintains that it still has rights of public access here, because of previous public use and the history of the road, but the lack of a recorded public easement means that the landowners hold the cards for now. 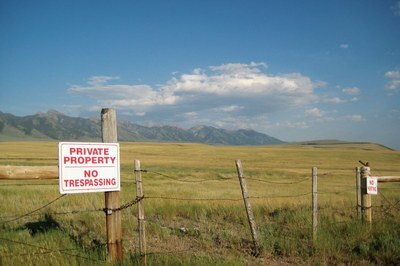 Carroccia’s policy, which requires hikers and horsepackers to sign in at his ranch house, makes it more difficult for the agency or Public Lands/Water Access to assert prescriptive access rights, because the signatures indicate that visitors are asking permission rather than freely using the route. It’s the kind of case that might be resolved only with a lawsuit triggered by cash-strapped PLWA or the Forest Service, or by an irate hunter cutting the locks. The district ranger here, Alex Sienkiewicz, who earned a law degree before going to work for the Forest Service, is clearly doing the best he can. “The reality is we have to triage,” he says. For now, the agency is focused on more promising cases, like a potential land swap that would resolve an access dispute on the Crazies’ west side. As for Sweet Grass Creek, where the lines between public and private blur, “some of these cases sit in limbo for a long time,” he says. Bernard Lea, retired from the U.S. Forest Service, now works with the Public Land/Water Access Association, training volunteers to search county records to document the historical ownership of roads. It’s a hot July day and I’m dodging cowpies on a faint trail that skirts the sharp front of Montana’s Madison Range, a string of 11,000-foot-plus peaks and alpine lakes towering above a river valley, southwest of the Crazies. I’m hiking toward Wolf Creek, a major drainage where a Forest Service trail climbs into the heart of this range. But already, as the sun starts to dip, I know I won’t make the 20 miles to Wolf Creek and back. Getting to the trail at Wolf Creek would actually have been easy, if I’d been willing to trespass: A road from the highway leads directly to the trail, crossing the sprawling Sun Ranch, which borders 14 miles of the Beaverhead-Deerlodge National Forest. As I piece together the Forest Service’s decades-long fight for access here, I uncover some incremental victories. But I also see more clearly how, once the public loses ground, it may be gone forever. A 1964 map shows Forest Service roads crossing the Sun Ranch, leading not just to Wolf Creek but to two other drainages to the south. Jack Atcheson Jr., who grew up hunting this area with his dad, remembers the access at Wolf Creek as being “as good as a trailhead” into the 1960s. “I’d leave my camper trailer there for three weeks,” he says. 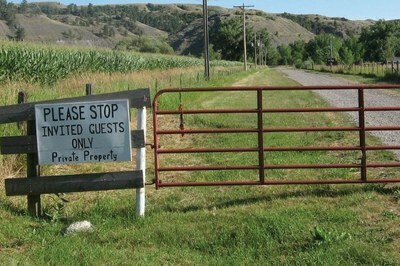 Montana-style humor marks a private property boundary. The Forest Service tried for decades to secure public access across the Sun Ranch, which borders 14 miles of national forest in southwest Montana. A road that crosses the ranch’s southern corner is the only public access to this part of the Madison Range today. But by the 1970s, the Sun Ranch owners were tightening access — perhaps at first by more strictly requiring permission, as happened at Sweet Grass Creek. Like Sweet Grass Creek, these roads had apparently never been formalized as public-access routes. By the late ’70s, there was no secured access along this 20-mile section of the Madison front. Atcheson, who was by that time guiding clients into Wolf Creek as an outfitter, using a less direct access road on a neighboring ranch with the landowner’s permission, urged then-District Ranger Vergil Lindsey to help turn the tide. “I could see (the access) drying up for everyone,” he says. Determined hunters still trekked to Wolf Creek on a faint and unofficial trail, which scrambled over difficult terrain to avoid trespassing on the Sun Ranch. After 2008, when Sun Ranch owner Roger Lang donated an easement, the Forest Service constructed a more moderate trail between Papoose Creek and Moose Creek, the middle of the three drainages. As I hike that trail today, it still fights the foothills topography, diving and climbing over several other drainages. In some places, it’s nearly illegible from disuse. It’s a good point. And it’s the main justification that the Forest Service now gives for apparently abandoning the fight for access to Wolf Creek. But it grates against another chapter in the Sun Ranch’s history, one that underscores how, in the end, the struggle isn’t just about whether there’s access — it’s about who has access, and whether that access is in the spirit of public ownership. In 1978, as Gildred was preparing to buy the Sun Ranch, Florida attorney Hamilton Kenner swooped in to buy the ranch himself. Kenner then flipped the ranch to Gildred, but not before piecing off sections on its north end, adjacent to the national forest near Wolf Creek. He subdivided that land, branded the development as Rising Sun Mountain Estates, and marketed it with bylaws and covenants specifying that anyone who bought in would have access to the national forest. All the lots sold. For decades Bill Orsello’s family used a road passing through private land to access national forest near Helena, Montana. Because the Forest Service didn’t have a public easement on the road, it was legal for the landowner to lock a gate and block public access. Kyle Newmiller sits in his idling truck, staring at the locked gate on the road up Sweet Grass Creek. “Someone should come up here and say: ‘If we catch you locking this gate, we’re going to write you a ticket.’ … What is the hold-up?” he says. He’s already talked to District Ranger Sienkiewicz and Public Lands/Water Access. Now he considers his more immediate options: Return to Rein’s house and hassle him for permission; go back into town and report to the county, where Tony Carroccia’s brother-in-law is the county attorney; or maybe get out of the truck and cut the locks himself. The hold-up is this: No matter how frustrated Newmiller is, this road — like all others — is private until proven or made public. And the hold-up can last for decades: For 30 years, a road 120 miles west of here was gated, blocking access to nearly 20 square miles of Beaverhead-Deerlodge National Forest that are otherwise hard to reach. Only in recent years did the county uncover clear evidence that the road was public, prompting county commissioners to personally cut the locks on that gate in 2012. The landowners took the case to court, and the judge upheld the public right of way. The Crazy Mountains near Clyde Park, Montana. The mountains lie within the Lewis and Clark and Custer Gallatin national forests, but parts of the forests are hard to get to because they’re surrounded by private land. Former HCN intern Marshall Swearingen freelances from Bozeman, Montana.